If the Big 12 needs some inspiration they can look no further than the Big East. The Big 12 was raided this summer, losing Nebraska to the Big Ten (starting in 2011), with rumors of more sweeping changes to come. Realignment was the buzzword for the offseason, bringing back memories of a not-so-long-ago conference shift that altered the landscape of East Coast football. That was a maneuver back in 2003 where Miami, Boston College and Virginia Tech defected from the Big East to the rival ACC. That move was supposed to drive a stake through the heart of the conference. However, since that shift the Beast has kept going strong, developing into one of the most consistent and underrated conferences not just in college football, but also in all of college sports. Since 2006, Big East teams have gone 35-30 straight up over BCS schools and since 2004 the Big East has been the best bowl conference in the country, going 20-11, including a 16-6 mark in the last four bowl seasons. While you can dispute the “quality” of those bowl wins the bottom line is simple: football is alive and well in the Big East. This season the league lacks a true national title contender and they have just two teams in the USA Today Top 25. However, there is still plenty of depth in the eight-team league and I would be surprised if any less than three-quarters of their programs found themselves bowling again this winter. According to Bodog, both Pittsburgh and West Virginia are equal favorites to represent the Big East in a BCS bowl game this year for Big East betting odds. Their odds are set at +250 apiece. Connecticut is listed next at +300 and then Cincinnati, Rutgers and South Florida are each posted at +600. Syracuse is the longest shot at +1800 and Louisville comes in at +900. Pittsburgh is ranked higher and is generally considered the best team in the conference. However, I’m going with the Mountaineers. They have the best record in the conference over the last five years and enter 2010 with the most experienced team in the league (17 starters back). The main issue is that their least experienced position is at quarterback, where sophomore Geno Smith is a bit of an unknown. However, he has the benefit of a strong offensive line, a go-to receiver and the league’s most explosive offensive player, Noel Devine. Devine and Jock Sanders could easily have the same impact as Clemson’s duo of C.J. 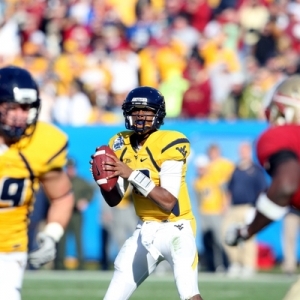 Spiller and Jacoby Ford last year and that should take some of the pressure off Smith for the Mountaineers. Defensively, the Mountaineers have the best unit in the league and that’s why they get my vote. They have eight senior starters and six three-year starters leading the way. West Virginia does have the misfortune of having to play at Connecticut and at Pittsburgh this year. But with Devine and that defense I think that this club can find ways to win. I’m not sold on Bill Stewart. But if he is anything as a coach he can make this team work. The main reason that I don’t have faith in Pittsburgh is Dave Wannstedt. Even though Wannstedt is a proven recruiter and has one of the most talented rosters in the league, the guy has proven time and time again that he can’t handle the pressure and is a terrible game day coach. The Panthers are also breaking in a new quarterback (Tino Sunseri) and they also boast a Heisman Trophy candidate at running back (Dion Lewis). But there isn’t much experience on this offense and I felt like their attack really overachieved last season, posting gaudy numbers against some horrific defenses. In fact, Pitt’s 11 returning starters on both sides of the ball are the fewest in the conference. Pittsburgh also benefited from some misleading turnovers numbers last year and this season they have just three conference home games. Further, they have a brutal nonconference slate. They open at Utah, they host Miami in late September, and they have to take a trip to South Bend to face Notre Dame. Pitt is 19-7 over the last two years but prior to that Wannstedt was just 16-19. I think that this club will definitely come up short of the expectations that they have. The Huskies have quietly put together a solid program and they have won eight or more games in five of the last seven years (including a 3-1 bowl mark). This might be Randy Edsall’s most talented team yet and I think that they are a definite threat to be one of the country’s surprise teams. Zach Frazer, a senior transfer from Notre Dame, is by far the most experienced and accomplished quarterback in the conference. Seven returning starters and a host of veteran talent, particularly on the offensive line, surround him. Defensively, four three-year starters and one of the toughest front sevens on the East Coast lead the way. Connecticut has also built a strong home field edge, going 15-4 over the last three years in Storrs, and they host both Pitt and West Virginia. We’ll find out a lot about this team in its opening game. They head to The Big House in Michigan to take on a Wolverines club desperate for a fast start. If the Huskies win that game they could very well be 7-0 when they host West Virginia in late October. They also have an extra week to prepare for Pittsburgh. With a win at Michigan and a split against the other top teams in the league Connecticut could find itself with 10 wins and a shot at a BCS bowl. The Bearcats have dominated the conference over the past two seasons, posting a 13-1 Big East mark, and they are 33-7 overall in since the start of 2007. However, Brian Kelly bailed for the Notre Dame job and the Bearcats lost a host of talent to graduation and the NFL. With a first-year coach and a quarterback that, while showing flashes last year, isn’t exactly a sure thing, it’s really difficult to predict how this team will respond. I have a feeling that Cincy will play with a chip on its shoulder this year in some misguided effort to “spite” Kelly. And with 17 of the 22 starting slots projected to be manned by juniors and seniors there is plenty of talent and leadership in the locker room. But the Bearcats have to fight through a tough opening month (two tricky road games at Fresno and N.C. State, as well as a “home” game against Oklahoma) so they don’t have much of a learning curve. That is bookended by a final month that has them at West Virginia, vs. Rutgers, at Connecticut and vs. Pitt. This could be a dangerous team to bet on or against this season. Let’s get one thing straight: the Orange aren’t ready to compete with the Big Boys in the conference. However, after being a complete and total disaster over the last five years (14-45 overall, 4-31 in conference) and suffering one of the worst collapses of any marquee program in recent memory, I think that Syracuse is headed in the right direction. I was on record saying that if wideout Mike Williams had returned this would have been a bowl team this year. He didn’t. But coach Doug Marrone has done a good job laying a foundation for a tough, physical football team. And while talent may be a question mark they have 15 returning starters on this team, including 10 from a defense that was No. 2 in the league in yards allowed in conference. They also got a boost when Delonte Carter, their top offensive threat, avoided a suspension for some off-field trouble. We’ll also find out if Marrone made a wise decision waiting a year of Ryan Nassib’s development by starting Greg Paulus last year. This team is going to fight. And while they aren’t ready for prime time I think they’ll pull an upset or two and threaten to make a bowl game. The Scarlet Knights had a nice little run there and looked for a minute like they were ready to take over the Big East. But I think that they overachieved last year and that there are a lot of troubling numbers that suggest a regression this season. They have lost a significant amount of talent over the last two years and they benefited from a ton of good fortune on both the turnover and injury fronts in 2009. They also padded their record last year against one of the sorriest schedules in the country (Howard, FIU, Texas Southern, Maryland, Army). They have just 12 total returning starters and apart from a few individual talents I don’t see much that scares me on this club. A rebuilt offensive line and an attack that lacks big play guys won’t help. They have to play Pitt, South Florida, Cincy and West Virginia on the road and they have tough home games against North Carolina and Connecticut. I see them losing five of those six games right there. So while they may go back to a bowl game I think that a 6-6 record (their worst since 2004) is in the cards. South Florida – On the one hand, the Bulls lost a load of talent and I’m still not 100 percent sure about sophomore quarterback B.J. Daniels. They have a new coach and new systems on both sides of the ball and they have nonconference games against Florida and Miami. Oh, plus a little negative karma after the scandal that led to coach Jim Leavitt’s ouster. On the other hand, they only have three Big East road games and there is a lot of natural talent on this roster. Expectations are low for this group, despite the fact that the Bulls have gone 34-18 over the last four seasons. Football is won and lost in the trenches. And South Florida has power on both the offensive and defensive lines. Mix in the top team speed in the conference and South Florida could be a tricky team this year. Louisville – This just isn’t a football school. And other than a brief run from 2003-2006 the Cardinals have been bottom feeders. They are breaking in a new coach and new systems on offense and defense, and the talent just isn’t there for the Cardinals to be a threat. The good news is that they have a candy corn schedule to start the year and should enter Big East play at 3-2. The bad news is that I’ll be stunned if they top the 1-6 conference marks that they have posted the last two years and they have to travel to The Dome to take on fellow bottom feeder Syracuse. Louisville has some offensive talent, especially running back Victor Anderson. But this is a weak team and one to fade in 2010 and beyond. Robert Ferringo is a writer and a professional sports and college football handicapper for Doc’s Sports. Last year his NFL picks brought home +62.5 Units for his clients and he is regarded as one of the top totals players for NFL odds in the sport. He guarantees a winning football season this year or he will work for free until you turn a profit. You can sign up for his college football and NFL picks and get more information here.